Marriage*: He married (?) MacDonald circa 1750 in Scotland. [S16] A. D. MacDonald, Mabou Pioneers, Volume I, page 88, 95. Birth*: (?) was born in 1720 in Bohuntin, Inverness-shire, Scotland. Marriage*: She married Donald Beaton circa 1750 in Scotland. Married Name: As of circa 1750,her married name was (?) Beaton. Nationalty*: Her nationality was Scottish. Married Name: Her married name was Beaton. Birth*: Christina was born circa 1830 in SW Mabou, Inverness, Nova Scotia, Canada. [S16] A. D. MacDonald, Mabou Pioneers, Volume I, 256. [S231] The Camerons, October 23, 1913, page 45. [S16] A. D. MacDonald, Mabou Pioneers, Volume I, page 256. Birth*: Dougald was born in 1770 in Scotland. Death*: Dougald died in 1820. [S262] Dr. Raymond A. MacLean, History of Antigonish, Volume 2, Page 91, note 30. [S231] The Camerons, October 23, 1913. Birth*: Lauchlin was born in 1820. Death*: Lauchlin died in 1880. [S16] A. D. MacDonald, Mabou Pioneers, Volume I, pages 257, 810-812. [S16] A. D. MacDonald, Mabou Pioneers, Volume I, page 257. [S709] Diocese of Antigonish, Nova Scotia, Canada , Baptismal record of Margaret Ann Cameron, page 189. [S16] A. D. MacDonald, Mabou Pioneers, Volume I, page 259. [S351] 1881 Canada Federal Census, 101 Newbury Street, Boston, Suffolk, Massachusetts, USA. [S16] A. D. MacDonald, Mabou Pioneers, Volume I, page 262. Language*: Alice Bridget McDaniel spoke English. 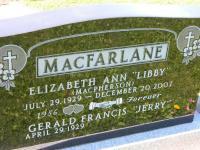 Married Name: As of 22 September 1925,her married name was MacFarlane. [S1027] 1921 Canada Census, McDaniel # 0408. [S1030] 1901 Canada Census, McDaniel # 0408. [S1028] 1911 Canada Census, McDaniel # 0408. [S861] Ancestry.com, online www.ancestry.com, 0861 - 0143 - Alice Bridget McDaniel.docx. [S429] Obituaries from The Halifax Chronicle Herald Newspaper, Obituary of Harold Joseph MacFarlane, March 30, 2007. Language*: Harold Joseph MacFarlane spoke English. [S5] Marriage, Church Record, November 1884 to September 1935 St. Joseph's Church, Margaree, Records, page 68, line 24. Language*: Margaret Ann MacDonald spoke English. Birth*: Margaret was born on 27 August 1929 in Nova Scotia, Canada. 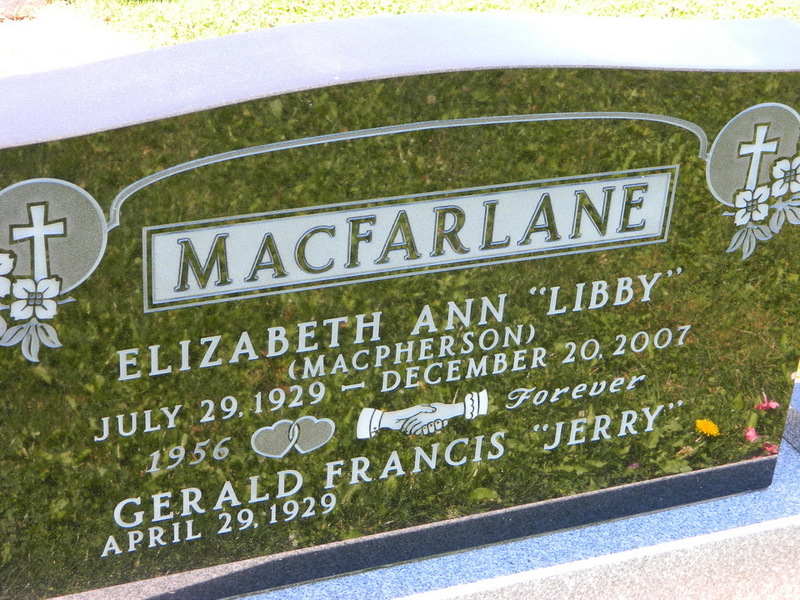 Married Name: As of 29 September 1951,her married name was MacFarlane. Married Name: As of 12 November,her married name was MacFarlane. [S629] Allan J. Gillis, "Descendants of Daniel MacPherson." [S429] Obituaries from The Halifax Chronicle Herald Newspaper, 24 dec 2007.